The BBC reports on the steady rise of vinyl in recent years. Now, there are a few reasons why some people still like vinyl. Obviously one reason is that DJs like to play around with them. Another reason we often hear is that some people think they sound better than CDs. I agree that there is something really nice about the sound of a vinyl record. But what’s often not appreciated is that a large part of them sounding good — not all of it, but a significant part — is that with vinyl you can’t apply the sort of heavy limiting and compression to the audio that you can for a CD. If you do it causes problems with the playablity of the record. I’ve banged on before on this blog about how the modern practise of using heavy compression and limiting in mastering is generally a bad idea, as although it makes tracks sound louder, it reduces the dynamic range of music, which makes the tracks sound boring and fatiguing after a while (and we didn’t apply much limiting to our album Honey and Lava). But if you use vinyl you’re automatically prevented from overdoing the compression/limiting. This means that modern albums that are released on both CD and vinyl have to be mastered differently. And that’s one reason, possibly the main reason, why some people swear that album X sounds better on the vinyl version than on the CD version. It’s also one reason why vinyl albums from the 70’s sound so good. Okay, maybe the music was better then. But maybe it’s because — or also because — the music hasn’t been limited to death. You can listen to vinyl albums from the 70s for hours, even ones with music you don’t much care for, and played loudly, without thinking after a while ‘Please turn this off, my ears need a rest’. This isn’t my idea, by the way. I first heard this claim made by Hugh Robjohns, Sound on Sound magazine’s resident tech guru. I think our mastering engineer Ray Staff may have also said this to me. Part of the sound of vinyl is the sound of a lighter touch with the limiter. Conclusion: If you tend to enjoy bands such as Ambrosia and Rush at their most friendly, then Coralspin is a band you should have good reason to check out, especially if you have a soft spot for vocalists with a distinct personal style that many would describe as unique to a lesser or greater extent – in this case female lead vocals with a certain theatrical and operatic flair. We’ll be supporting The Prog Doctors (prog covers band) at The Diamond in Mansfield on Sun April 14, 2013. So if you’re from around Mansfield, that night is your chance to get a big dose of prog both old and new, at a great venue (our bassist Mick has played there before and says it is a really good place, with a quality PA and gear). Venue details: 47 Stoney Street, Sutton-in-Ashfield, Mansfield, Nottinghamshire, NG17 4GH. We made no. 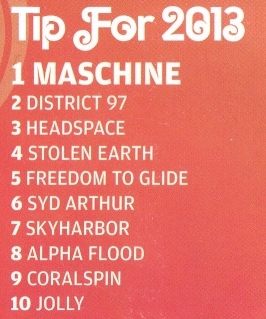 9 in ‘Tip for 2013’ in Prog magazine’s 2012 Reader’s Poll. Thanks to everyone who voted for us. (In case you’re wondering we didn’t ask anyone to vote for us or even alert anyone to the existence of this poll). To celebrate I shall eat 9 Smarties of varied hues. It Bites’ album Map of the Past arrived recently. On the cover was stuck a list of tour dates. And this reminded me of something that drives me nuts. (Well, all right, slightly annoys me). Every second band, venue or promoter webpage I go to (and even some festival pages) lists some exciting upcoming gig, but the date never mentions the year! This, of course, wouldn’t matter if bands and venues and promoters and festivals never folded, or if, when they did fold, they put a note on their web page to this effect. But of course bands, venues, promoters and festivals fold all the time, or they just run out steam, and they let their web pages just stay there, for years and years, with that exciting gig from 3 years ago still up there on the front page. And it’s up to you to work out whether this gig really is upcoming, or some ancient relic of history, by consulting a calendar to see if the date matches up with the day of the week. But then some of these web pages don’t even mention a day of the week! It’s just ‘Gig on June 18 at The Flying Monkey’, a date a suspiciously long way off. So you have to look up The Flying Monkey’s webpage to see if that gig is on this year. But The Flying Monkey’s webpage does the same thing! No years, and sometimes no day of the week. So then you have to do some more detective work. Not hard detective work, sure, but a time-waster when it happens over and over. So thank you, defunct band that couldn’t be bothered to update their web page when the bass player went to Dubai and they never found anyone else. So what was on the It Bites sticker? A list of tour dates with no year and no days of the week listed! I’m going to presume that these are 2012 dates, because that’s when the album was released. But what a shame if they were 2013 dates, and nobody realized? A great song from the 70’s from semi-prog band Voyager, with sappy Hipgnosis video.